One Tarte Shape Tape Concealer is sold every 20 seconds. Take that in for a minute. The creamy, buttery formula that hugs your under-eye and spreads to cover everything in its path (dark circles, fine lines) has garnered a well-deserved devoted fan base. And now, POPSUGAR can exclusively share that Shape Tape is getting a sister! You've seen the teases, and we can confirm that Shape Tape Foundation ($39) is coming this month. There is more — Tarte is having twins, because there are two formulas! Plus, there's a new paddle brush and blending sponge. Deep breath in . . . deep breath out. 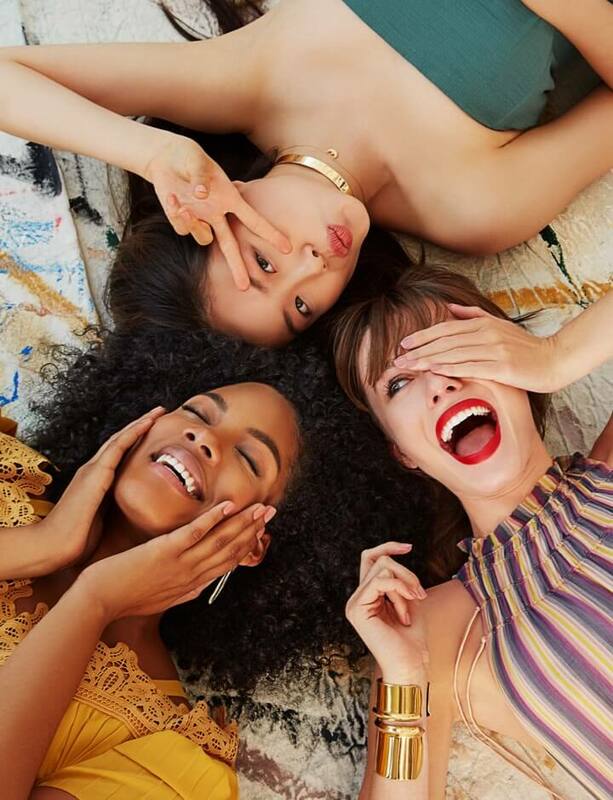 It all launches at tarte.com on Jan. 15, at ulta.com on Jan. 21, and in Ulta stores on Feb. 4. Bets on how many of those babies will sell per minute? 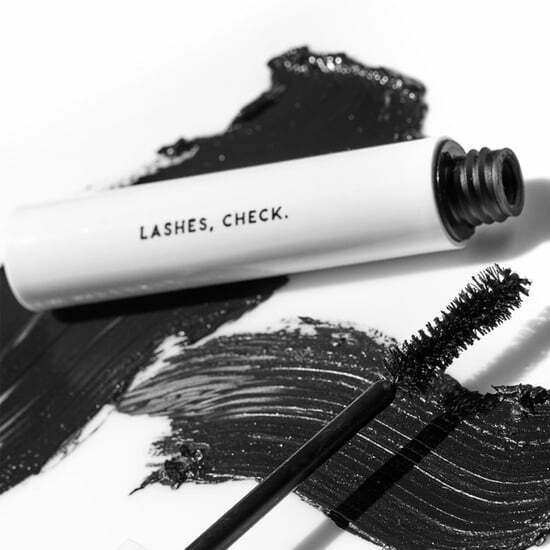 Let's chat through every single detail of these two formulas that include — you guessed it! — Matte and Hydrating finishes. The bottles are packaged almost identical, save for the fact that Matte has a purple strip under the cap and Hydrating has a blue one. It truly looks like a giant Shape Tape Concealer in that the cap has the same purple chevron-and-gold pattern. Shape Tape Foundation also has a bigger doe-foot wand shaped just like the concealer wand. 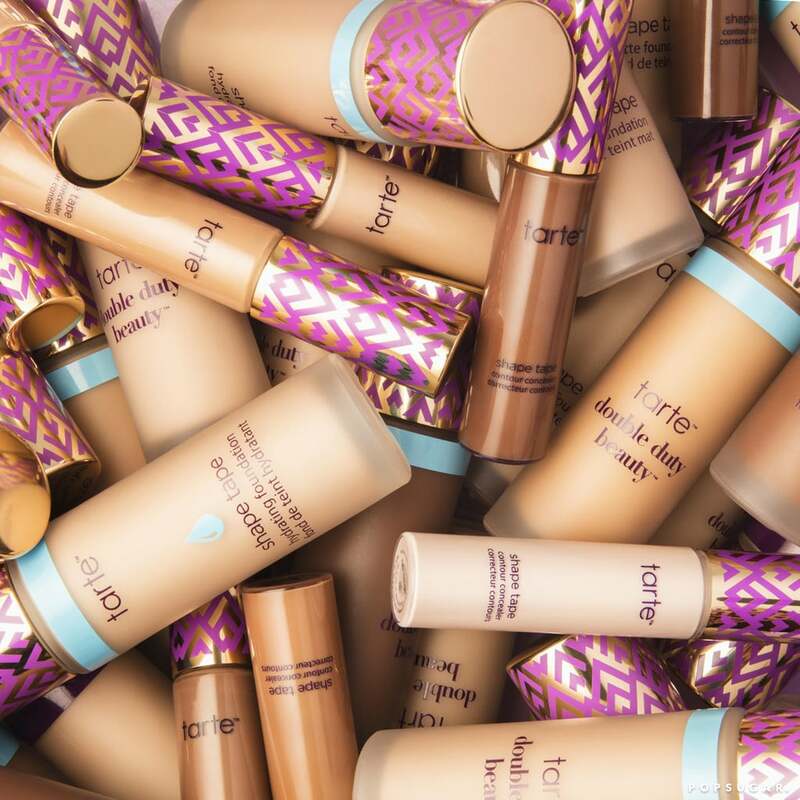 The Tarte Shape Tape Matte Foundation is your vegan, oil-free, full-coverage pick. Oh yes, and it's waterproof, so you can check off the "stay-all-day" box. 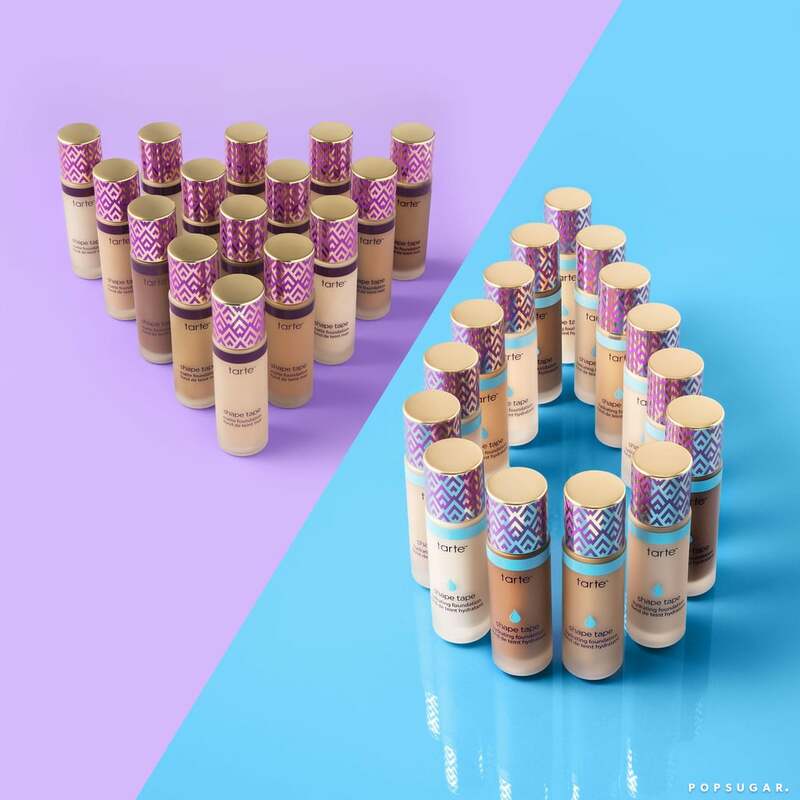 Think of it as a big version of the Shape Tape concealer in that it will totally correct and cover everything under it, including smoothing over pores, acne, and redness. This is your Instagram filter in a bottle. It's so matte, in fact, that you won't need setting powder on top of it. The 15 shades are made of vitamin E, which offers emollient and antioxidant properties, as well as mineral pigments to offer that soft, airbrushed look. A rep from the brand suggests applying it in sections to your face, because it sets quickly. It is recommended to use it with Tarte's new Double Duty Beauty paddle brush ($28) — which is gold and purple, matching the whole Shape Tape line. The soft, yet dense brushes buff the formula in to create a doll-like canvas. The Tarte Shape Tape Hydrating Foundation is for those of us who love to look dewy and are all about skin care. The oil-free formula promises 12 hours of wear with a luminous finish. 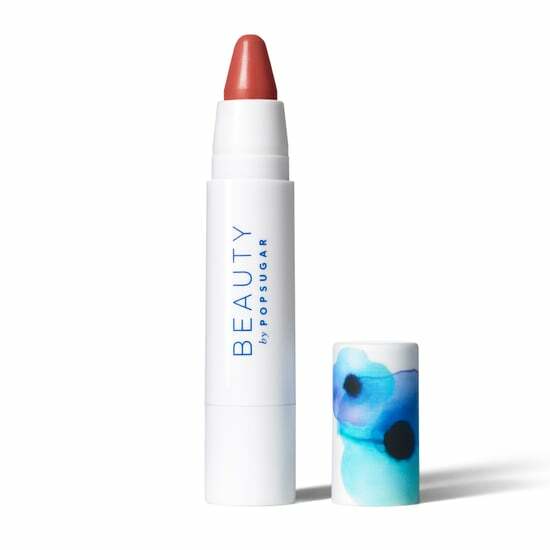 The gel-like texture is creamy and more blendable than its Matte counterpart. You can still see the skin under it, but if you like lighter foundations, note it can be built up to thicker coverage. It also feels a bit more cooling on the skin than the Matte version. We would suggest the Hydrating one for warmer months and tropical vacations since it will give you a glowy look and resist against sweat. What's more: our Hydrating friend is packed with skin-benefiting ingredients. It has collagen and hyaluronic acid to plump skin, as well as biopolymer filling spheres that help to smooth out your complexion while keeping moisture in the skin cells. 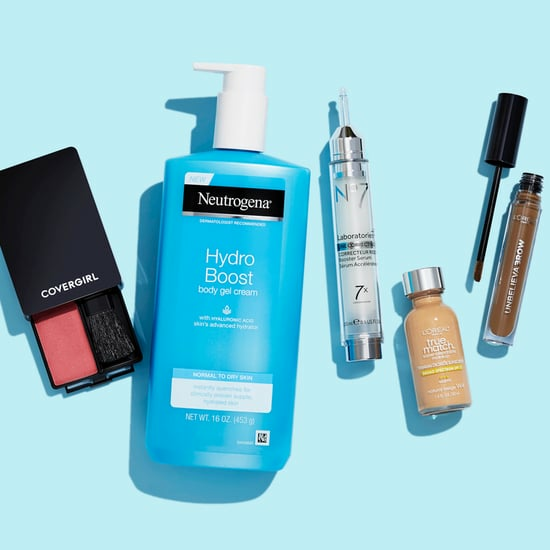 There are also holistic ingredients like barley extract (firms the outer layer of skin), vitamin C (an antioxidant that is potent against the sun), and the brand's signature Amazonian clay (provides the longwear property we love from Tarte). Like Matte, the Hydrating formula is meant to go with a special blending tool. 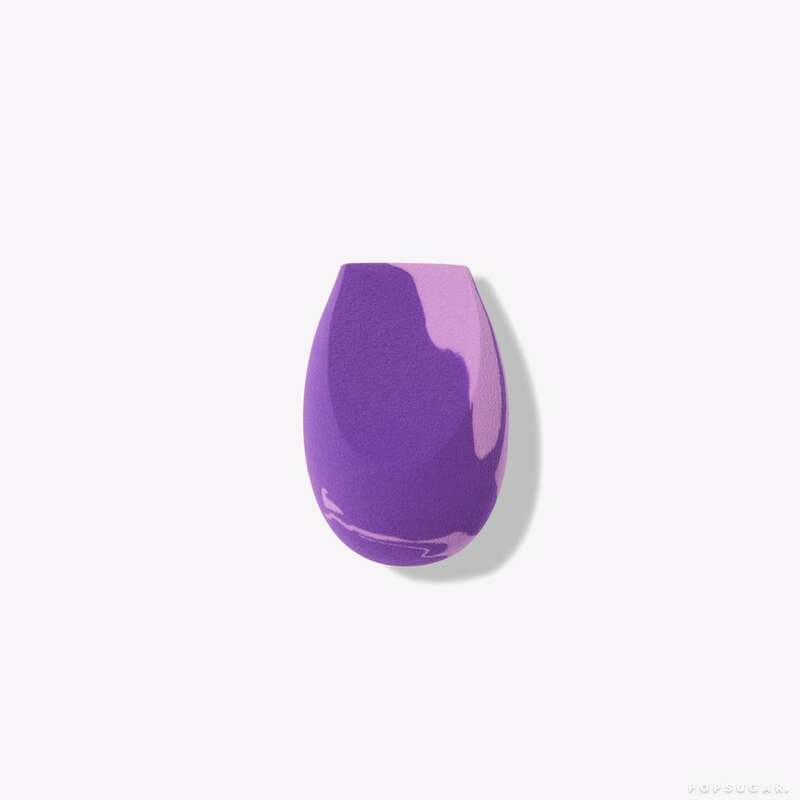 The Shaper Contouring Sponge ($18) has a festive, two-tone purple marble print. It's rounded on one side, with two flat sides that are meant for blending and contouring. The precision chiseled tip — which is a flat rectangle — fits into hard-to-reach spots, such as around your nose or eyes. To use, simply wet it with water (old school), serum (to look even dewier), or setting spray (for a mattifying effect), and blend the gel foundation in. 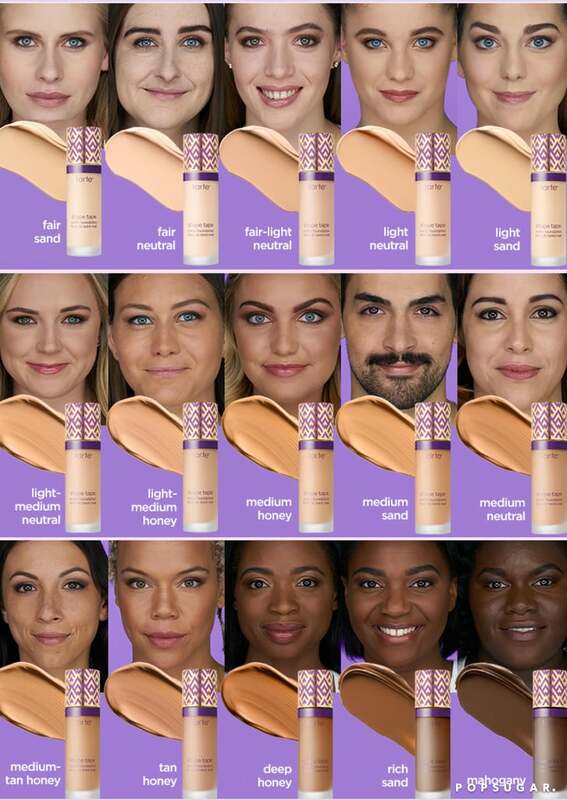 The 15-shade range includes porcelain, fair beige, fair-light neutral, light neutral, light sand, light-medium beige, light-medium honey, light-medium sand, medium honey, medium sand, medium neutral, medium-tan honey, tan sand, deep honey, and mahogany. 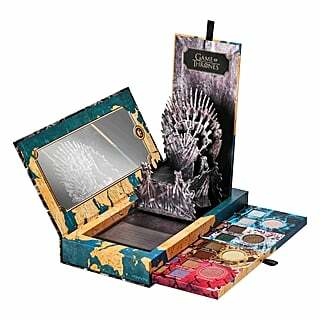 Keep reading to see the first official images of this major collection!